Made in the Netherlands for import into Great Britain, circa 1895. The hinged box has scenes of putti in Rococo style scenes all the way around and on the lid. 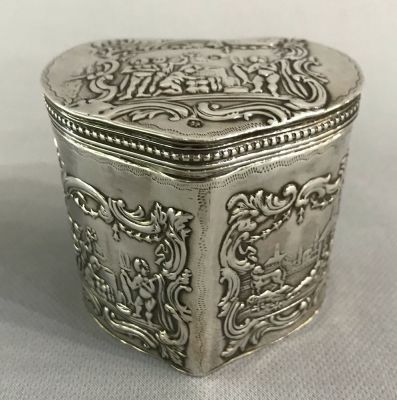 The box has Dutch silver marks dating it for 1895, and that it was made for export. The import marks are for Sheffield 1894. Until 1975 the British hallmark dates changed on July 1, dating this piece to the first 6 months of 1895. The importer was Samuel Boyce Landeck of Campden Sauare, London, UK. 2 7/8” by 2 1/4”, 2 5/8” high.